When they established design studio Snarkitecture in 2008, Daniel Arsham and Alex Mustonen set out to reimagine the relationship between art and architecture, while encouraging the public to approach their spaces with the curiosity of children. In the years since, the firm's interactive installations have taken over galleries, shopping malls and public spaces around the world. One of Snarkitecture's most popular traveling works, "The Beach," transforms indoor locations (from a museum in Paris to a mall in Bangkok) into holiday resorts complete with "water" made from over a million recyclable, antimicrobial plastic balls. 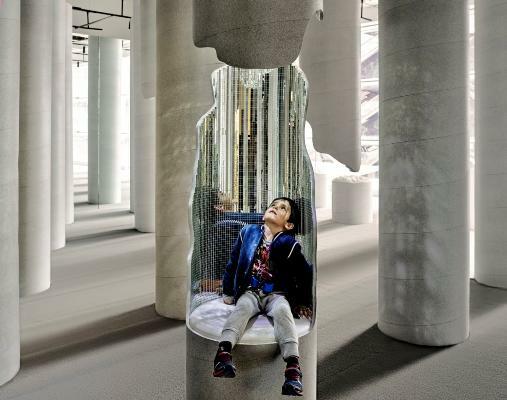 This weekend, the studio will unveil its most ambitious project yet: Snark Park, an exhibition space in New York's Hudson Yards that will host three playful, interactive installations a year. Like Snarkitecture's previous projects, the park can be expected to play with a range of scales, materials and technologies. But as a permanent space, it offers them freedoms that their popular temporary exhibitions never could. "(Snark Park) was an opportunity (for us to) literally control and curate everything, the full experience," Arsham said during a preview tour of the space. "It's a whole new level of design." The naturally lit space of over 6,000 square feet is completely monochromatic, making it reminiscent of a futuristic movie set. For the space's first installation, "Lost and Found," Snarkitecture created a grid-like forest of columns that emerge from the ground at varying levels like stalagmites. The floor, which is made with thick foam, is just one of the design features used to encourage visitors to thoughtfully interact with the space. "A lot of the design is meant to slow you down," said Snarkitecture partner, Benjamin Porto. "You see that with the floors, but also with the blacked-out entrance (where you have to) take a step back and explore, peek around corners, and notice how the space changes as you move through it." Running your hands along the rough white totems (some with cutouts for visitors to climb into) one will discover surprising materials -- including white ping pong balls and faux fur -- lining the interiors. Subtler details, like the scent that fills the room and an ambient soundtrack by Polish electroacoustic composer Michal Jacaszek, further enhance the sensory experience. With museums and galleries now increasingly focused on visitors' experiences and -- for better or worse -- the Instagram value of their exhibits, Snarkitecture's early command of experiential design was evidently ahead of its time. Snarkitecture's traveling installation, "The Beach," transforms indoor spaces into beach resorts with "water" made from over a million plastic balls. "We often thought about creating an architecture where you are not just touching the floor -- you are engaging with it in different ways," Arsham said. "That happens to be something that people react well to. "Certainly, other museums and intuitions are realizing that this is a draw and a different way to engage audiences. We had already been doing it -- not that we are the first or anything -- but it's always been a part of the ethos of the studio."